The rolling mountains of Asheville, North Carolina are home to the Blue Ridge Mountains. Here, sturdy oaks, beautiful maples, chestnuts and fir trees add to the beauty of lawns and sidewalks, parks and businesses. Family Tree Services helps residential and commercial properties to maintain healthy, beautiful trees and shrubs year-round. Family Tree Services specializes in trimming and pruning trees. Ornamental trees require a delicate touch to maintain their proper shape and height. Our experts carefully clip only the necessary branches for the optimum beauty and health of your tree. Sometimes pruning is needed to remove branches that are too heavy for the tree. At other times, it may be necessary to reduce the height of a tree. Dead wood always needs to be removed. We are extremely choosy about what is removed, always using the ‘less-is-more’ approach to pruning. Residential tree service in NC consists of more than pruning and trimming. Spraying, diagnosis for different diseases and even measures to protect against drought are all necessary services. At Family Tree Services we provide seasonal and annual maintenance for your trees. A healthy tree can better withstand the ice, snow and blowing winds of winter or the sweltering heat of summer. A certified arborist on our staff can tell us exactly how much water, sunlight, nutrients and care your trees will need to be at their very best. Asheville and the surrounding mountains are thronged with tourist during the autumn months. People come from all over the country to experience the brilliant reds, purples and yellows of the trees. Many residents can enjoy these colors in their own yards with fiery reds, oranges and yellows of the maples. These trees are special. When they are damaged by high winds or storms, we can assess the damage. Hazardous tree inspections will determine whether measures can be taken to save the tree (cabling and bracing) or whether the tree needs to be removed. This service is not just provided after a storm. We will come to your property and assess all of your trees. Looking for dead, dying or diseased branches, splits in the trunks and roots that are dangerous, we can analyze which trees, if any, need removal. Our objective is to make your property safe and to reduce the chance of liability due to a tree falling and damaging property. Home tree care can involve more than just tree care. Tree removal is part of the care of your property. If a tree is leaning, if it has outgrown the area, or if the roots are breaking your sidewalks or damaging sewage lines, it needs to be removed. Homeowners shouldn’t try to remove a tree. Call us instead. Our professional staff is trained in the latest techniques to safely take down a tree. We will cut it down and haul away the wood, leaving you with a beautiful yard. Part of tree removal is the stump. Many companies leave them for homeowners to deal with. Stumps are unsightly, dangerous and can bring in termites and other dangerous bugs. We have the equipment to grind those stumps completely out. Once the stump is gone, you can choose to fill the hole with dirt or replant a tree or flowers in the spot. It’s not enough to be the Asheville North Carolina leader in residential tree care. We also offer services to start beautiful yards. Our tree and plant installations can make new properties look established. Yards that have been newly graded will need trees and shrubs. Borders of Leland Cypress, drives lined with pecan trees, or shrubs like azaleas and rhododendrons can dramatically increase the value of your new home. We can recommend what types of trees and shrubs would look great in your yard. We can also assist you in choosing the perfect spot for the tree based on it’s need for sunlight, water and drainage. Maybe you have a special tree that you want to bring along to your new home. Was it a favorite oak tree that your little girl played in? We have the knowledge and equipment to safely transplant the tree from one area to another. We will make sure the structure is supported after the transplant, allowing the tree the best chance for survival. NC home tree care is our specialty. Our family business offers free estimates for any of your residential tree service. We also take pride in offering ground maintenance and fire wood sales to our customers. Family Tree Services is licensed, insured and bonded. 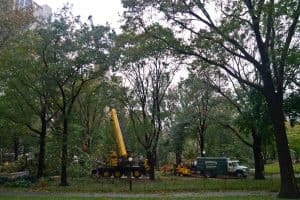 You can be confident that our highly trained employees will use modern equipment and all of the safety devices to necessary to provide you the best residential tree care. Fast, effective and affordable, our customers love to recommend our services to their friends and co-workers. Call us 24/7 for emergency tree service or ask about our maintenance programs. See the difference Family Tree Services can make for your property.